All of the articles are written by some really inspirational photographers, so I think you’ll learn a lot from every page of the ebook. One of my favorite things about the book is that at the end of every article there are links to more ebooks that explore that topic in more depth. And, if you enjoy their free ebooks (which I’m sure you will! ), then I’d highly recommend checking out some of their paid eBooks too. 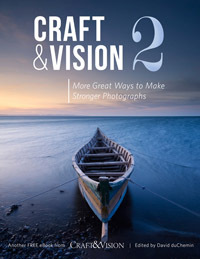 I’ve been reading eBooks from Craft & Vision ever since they started publishing, and I feel like their books are some of the best resources for improving your compositional skills. They’ve put together a great team of photographers. Get more great tips in our free weekly newsletter.